Engineers at the University of Hong Kong and a private renewable energy company have developed a new micro wind turbine that can generate electricity even if wind speeds are as low as two meters per second. “We never stop this machine and they never stop because there is always one meter per second wind – 365 days, 24 hours a day, they keep working,” said Lucien Gambarota – the main inventor of the technology. They are ideal for crowded cities because they can be installed on rooftops and balconies. 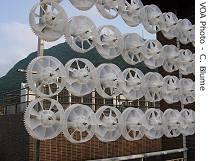 Their design is simple: plastic gearwheels, each about 25 centimeters in diameter, are linked to one another and turn, moved by the wind. Groups of gearwheels can be arranged in an array of shapes and sizes. The energy generated by the turbines is stored in a battery, which then powers electrical appliances. The wind turbine is easy to install and comparatively cheap. At the moment, a set of 20 gearwheels costs about $25. Gambarota says the price will go down once the turbines are being mass-produced. This cool site: M-trends talks about the innovative Spanish startup Futurlink. At this year´s 3GSM tradeshow in Barcelona, Futurlink presents Wili-co-ITS, a new way to get content like music to your cell phone directly from the point-of-sales, say a Mac Donald´s. So, in the near future, whenever you go to get a burger, instead of a Bionicle action figure, you may end up with the new song from the Black eyed peas. This technology works through an interactive touch screen with an advanced Bluetooth and Wi-Fi application platform.